Once you discover the activities you most enjoy underwater, the best thing to do is to take a PADI Speciality Course and fine-tune your skills in that particular activity. Wreck Diver, Enriched Air Diver, Deep Diver and Digital Underwater Photography are common choices. Breathe easy knowing that you know how to recognize illnesses treatable by emergency oxygen. Though suited for divers, this course has no prerequisites and doesn’t include dives, which means it is equally applicable to those who are around divers – boat crew, non-diving buddies, lifeguards, and shore staff. You don’t need any previous CPR or first aid training to take the course. You will learn how to recognize diving illnesses treatable by emergency oxygen, properly setup equipment and administer emergency oxygen. The PADI Emergency Oxygen Provider course can be completed in 3-4 hours. Underwater photography is one of the most popular diving specialities, and the rise of digital underwater photography has made it easier and more fun than ever. The PADI Digital Underwater Photographer course gets you going quickly with todays modern digital equipment, whether you use a point-and-shoot snap camera or a sophisticated D-SLR like the pros. The best part is that you will also get a copy of all of your photos from the course, so you can share your experiences with family and friends. Our instructors are all avid photographers and are more than happy to share their tips and tricks, from composition to lighting and post-processing. You can use your own camera if you have a housing for it, or simply rent a camera from the diveshop. Once you take this course, prepare yourself for a new hobby - taking photos underwater is very addictive and one of the most satisfying things to do underwater. Having good buoyancy underwater is essential to taking good pictures, so the PADI Peak Performance Buoyancy course is also a great course to consider adding to your arsenal to improve your photo-skills. The PADI Enriched Air Diver course is PADI’s most popular speciality scuba diving course. Scuba diving with Enriched Air Nitrox gives you more no decompression dive time. This means more time underwater especially on repetitive scuba dives, and your surface interval time in between dives is also reduced. To enroll in the PADI Enriched Air Diver course, you must be 12 years or older and have a PADI Open Water Diver certification (or have a qualifying certification from another organization). You will learn techniques for getting more dive time by using Enriched Air Nitrox, Enriched Air scuba diving equipment considerations, how to manage oxygen exposure, how to tell what’s in your scuba tank and how to set your dive computer. 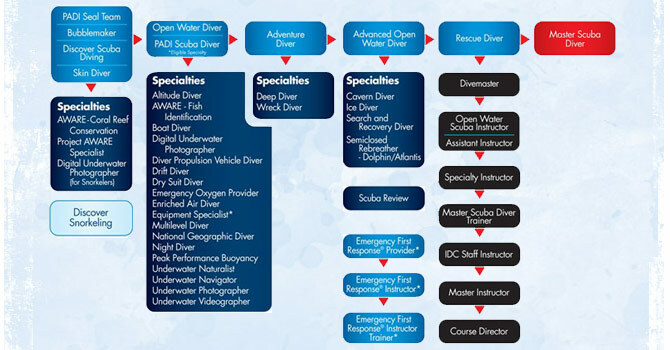 There are no required dives to gain certification and can be completed in one day. The PADI Enriched Air Diver course can also be combined with other specialities such as the Deep or Wreck Diver specialities. After your first few scuba dives, you soon want to explore a bit deeper. There’s something exciting and mysterious about the depth that attracts divers. The PADI Deep Diver Speciality course can be completed over 2 days and will open up dive opportunities that are inaccessible to others. The course covers techniques for diving in the deeper range of 18-40 meters. You will also cover deep scuba diving equipment considerations, and gain experience in planning, organizing and making at least four deep dives under the supervision of your PADI Instructor. As a bonus, you will get to experience the thrill of going where most people cannot. Afterwards you are certified to dive to 40m. The most common reason for having to end a dive is poor air consumption. The best way to fix this? PPB - The PADI Peak Performance Buoyancy Course. The key to becoming a better diver is to be neutrally buoyant at all times . It can be a tricky thing. Divers who’ve mastered the highest performance levels in buoyancy stand apart. You’ve seen them underwater. They glide effortlessly, use less air and ascend, descend or hover, almost as if by thought. They interact gently with aquatic life and affect their surroundings minimally. The PADI Peak Performance Buoyancy course refines the basic skills you learned as a PADI Open Water Diver and elevates them to the next level. The fun part of this course is giving your dive skills a polish in ways you may not have thought possible. Dives include swimming through hoops, buoyancy games and mastering hovering in different positions. You will learn how to trim your equipment so you’re perfectly balanced in the water, and how to streamline yourself to save air and move smoothly through the water. Email info@scubadivingperhentian.com or call 012-9212395 for more details.